Martin L. Horn, Sr. (center) with sons, W. Donald Horn (left), and Martin L. Horn, Jr., in 1955. The year was 1942. Local businessman Martin L. Horn Sr., (who owned and operated a thriving business nearby) purchased a property adjacent to the famous Eagle Rock area of West Orange. Horn began an extensive renovation that transformed a gracious home and its surrounding property into a private luncheon club, The Mayfair Club. In the years that followed, the club evolved into a highly regarded restaurant and catering facility now known as Mayfair Farms. Today, some 70 years later, four generations of the Horn Family have left their imprint on this modern day icon located near the intersection of what once were two quiet country roads. They continue to offer a firm commitment to the family policy of serving the highest quality foods in a timeless and elegant atmosphere. 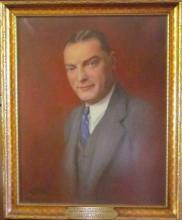 The portrait (shown at above right) of Martin L. Horn, Sr. was awarded to him in 1943, in appreciation and recognition of his faithful service as the first President of the New Jersey Restaurant Association. In its seventh decade, Mayfair Farms continues to thrive under the guidance of Martin L. Horn's Grandsons, Peter, Marty, Jimmy and Don Jr. (pictured left to right) with the late W. Donald Horn.